We will be having our dedication the Friday before the Holiday, on the Court house lawn. 11:00 in the morning of Friday, May 24, 2019. Three Viet Nam Vets on being dedicated, David J Matthews, Vance Piper and Donald A Sherman. Come and join us. Anyone ordering Legacy Stones. Please call Nancy Quick to place your order. 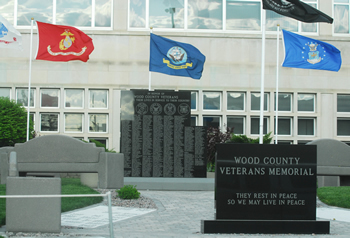 Wood County Veterans Memorial web site. A reminder that we still need stories about your lost hero. They rest in peace so we may live in peace. The Wood County Veterans Memorial Committee is dedicated to preserving the memory and honor of all Wood County veterans, of all wars, who died in defense of the principles and freedoms of the United States of America. A memorial honoring all Wood County veterans who died as a result of service to our county will be erected on the front lawn of the Wood County Courthouse in Wisconsin Rapids.